After about a week in detox, the men spend 60 to 90 days in this room during their treatment at Recovery Point. A bulletin board in the detox unit at Recovery Point of Huntington, W.Va., a residential drug and alcohol treatment facility, is covered with photos of former residents who died of their addictions. Matt Boggs is the executive director of Recovery Point and a 2012 graduate of the program. He says he walked into the center with a bag of dirty clothes, "sick and tired of the way I was living." (Left) Terry Lilly, 36, of Charleston, W.Va., has been clean about four months. 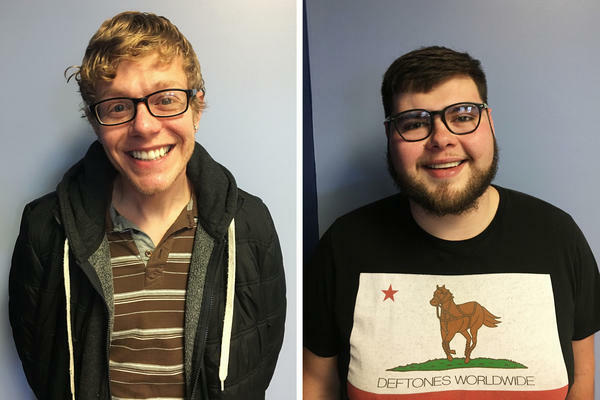 (Right) Jarrod Book, 24, of Akron, Ohio, says his heroin addiction, and the criminal justice system, brought him to Recovery Point. Decorations are sparse at Recovery Point, a residential treatment center in Huntington, W.Va. That's why the bulletin board covered with photos of men stands out. The men spent time here, but didn't survive their addictions. They're all dead now. "We keep a constant reminder in here for individuals who come into our detox facility. We have, 'But for the grace of God, there go I,'" says Executive Director Matt Boggs, pointing to the words on the board. Boggs, 35, would know. He started as a resident here five years ago, looking for a way out of addiction and homelessness. Recovery Point runs four facilities in West Virginia, offering nonmedical detox and long-term residential treatment to people struggling with drug and alcohol addiction. In Huntington, about 100 men at a time live in this former elementary school building in a working-class neighborhood. There's plenty of demand for facilities like this one; West Virginia consistently leads the nation in drug overdose deaths. President Trump and other candidates addressed the nationwide addiction crisis many times on the campaign trail, sometimes with testimony from family members of those affected. Now, people who have been affected by the crisis, including the residents of Recovery Point, are looking to the president for help. Terry Lilly, 36, came to Recovery Point from Charleston, W.Va. Lilly was a computer programmer and then a manager at a nationally known company. He didn't get hooked on heroin until his 30s, when he was playing music in bars and decided to give heroin a try, out of what he describes now as "morbid curiosity." "It scratched my itch," he says. "It helped me deal with the emotional problems that I wasn't dealing with, so it didn't take long for me to give away my career, my house, my car." Lilly's recovery has been full of stops and starts. This time, he has been clean for four months. As he looks to the future, he's worried about politicians' talk of repealing the Affordable Care Act. He gets health insurance through the federal Medicaid program, which was expanded under the ACA and now covers more than half a million West Virginians — more than one-quarter of the state's residents. "I'm not in a position to pay for that right now, but I have been in the past and I would like to be in the future," Lilly says. "So I really feel like this time in my life is what those programs are for, when I need a helping hand." Medicaid doesn't pay for treatment at Recovery Point; the facility is mainly funded by grants and donations, and run in part by residents like Lilly who have already completed several months of treatment. But Boggs, the program's director, says Medicaid provides basic health care for many of the residents here, and essential mental health care for issues that can complicate their recovery. If Republicans repeal Obamacare as they've promised, Boggs says he hopes there's an equivalent replacement ready to go first. Some residents are hoping the federal government will address the challenge of re-entering society with a criminal record. For 24-year-old Jarrod Book, of Akron, Ohio, an alternative sentencing program is giving him a chance to clear his drug conviction. He says he'd like to see the new administration champion sentencing reform. "Like nonviolent drug offenders who maybe, you know, messed up a little bit in their life," Book says. "If it wasn't for something like that, I wouldn't be here." Book says he hopes the attention presidential candidates showered on the opioid epidemic during the campaign will help to destigmatize the problem. Aaron Pardue, 28, of Pocahontas, Va., hopes the publicity will bring more funding for treatment in communities across the region that are overwhelmed with need. "For me it just seems like it's a shame that it takes the politicians and the celebrities and all the bigwigs in this country, for it to start happening to them personally, before it becomes an issue for them to start dealing with it," Pardue says. But Pardue, who has been clean for 15 months, says he can't think too much about what the politicians might do. He needs to focus on his recovery. "I mean I haven't been living on Saturn or anything," he says. "I know what's going on, but that's one less distraction that I need right now." The country's opioid crisis was a major topic during the presidential campaign including for then-candidate Donald Trump. PRESIDENT DONALD TRUMP: We lose thousands of our fellow Americans every year to opioid abuse. SIEGEL: Well, now that he's president, millions of Americans are looking to Trump for help. The state of West Virginia leads the nation in deaths from drug overdose. And NPR's Sarah McCammon traveled to Huntington, W.Va., where she asked several men in recovery about their hopes for the new administration. SARAH MCCAMMON, BYLINE: In the detox room at Recovery Point, there is a bulletin board covered in photos of men who spent time here but died of their addictions. MATT BOGGS: So we keep a constant reminder in here for individuals who come into our detox facility. We have - but for the grace of God, there go I.
MCCAMMON: Thirty-five-year-old Matt Boggs is now the executive director, but he didn't start out that way. BOGGS: You know, walked in here homeless with a bag of clothes. The clothes I had on were dirty and hadn't been washed in days, but walked in here just sick and tired of living the way that I was living. MCCAMMON: For Terry Lilly from Charleston, W.Va., the path to recovery has been full of stops and starts. This time, the 36-year-old says, he's been clean for about four months. Lilly didn't get hooked on heroin until his 30s. TERRY LILLY: You know, it scratched my itch. It helped me deal with the emotional problems that I wasn't dealing with. And so it didn't take long for me to give away my career, my house, my car, things like that. MCCAMMON: He'd been working as a computer programmer and then a manager at a nationally known company. LILLY: It was a great job. Like, I really loved it, but I loved heroin more (laughter). MCCAMMON: Lilly says one of his biggest concerns is talk of repealing the Affordable Care Act. His health insurance is through the Medicaid program which was expanded under the ACA. LILLY: I'm not in a position to pay for that right now, but I have been in the past, and I would like to be in the future. So I really feel like this time in my life is what those programs are for, when I need a helping hand. MCCAMMON: Lilly is typical of residents here who are not prescribed addiction medication, but often rely on Medicaid for basic medical care. Recovery Point does not get Medicaid reimbursement. Instead, it's funded largely through grants and donations and run in part by residents like Lilly who've already completed several months of treatment. 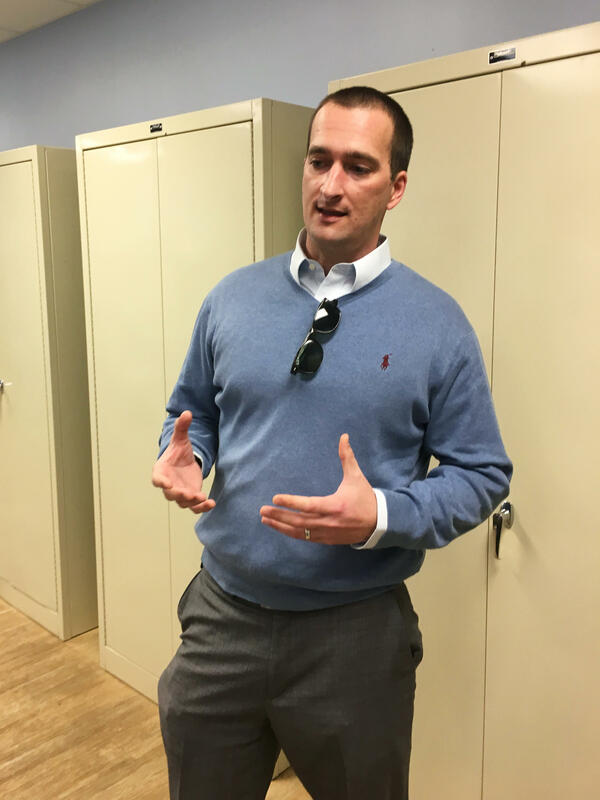 But director Matt Boggs says Medicaid is important for many of the men here who need mental health care for issues that can complicate their recovery. BOGGS: While we're going to provide our services here, whether Medicaid happens or not we're still going to be here, but the individuals in our program are not going to be able to access those essential benefits that they need. MCCAMMON: Boggs says if Republicans repeal Obamacare as they've promised, he hopes there's an equivalent replacement ready to go first. Another issue some residents are hoping the federal government will address is the challenge of re-entering society with a criminal record. For 24-year-old Jarrod Book of Akron, Ohio, an alternative sentencing program is giving him a chance to clear his drug conviction. He says he'd like to see the new administration champion sentencing reform. JARROD BOOK: Like non-violent drug offenders who maybe, you know, messed up a little bit in their life. Because otherwise, I mean, if it wasn't for something like that, I wouldn't be here. MCCAMMON: Book says his struggle with addiction began after a family member introduced him to cocaine at age 11. He says he hopes the attention that presidential candidates showered on the opioid epidemic during the campaign will help to de-stigmatize the problem. Twenty-eight-year-old Aaron Pardue of Pocahontas, Va. says he hopes it will translate into more funding for treatment in communities across the region that are overwhelmed with need. AARON PARDUE: For me, it just seems like it's a shame that it takes the politicians and the celebrities and all the big wigs in this country for it to start happening to them personally before it becomes an issue for them to start dealing with it. MCCAMMON: Pardue, who's been clean for 15 months, says he's been far more focused on his own recovery than presidential politics. Whatever the new president does to fight the opioid epidemic in the years to come, Pardue and the other men here will be waging their personal fight against addiction every day. Sarah McCammon, NPR News. Transcript provided by NPR, Copyright NPR.